What child doesn't dream of galloping away on their own beautiful horse? 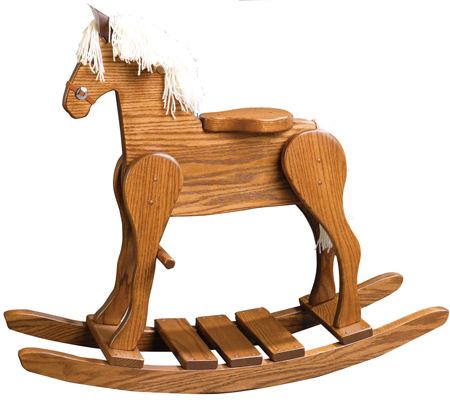 Fulfil their dreams with our solid, American made rocking horses! Choose your own stain color on Oak and Cherry, or pick out one of our fun, handpainted Poplar rocking horses. The floor-to-seat height is 17.5" on most of the rocking horses. The only exceptions are the Small Rocking Horse (13.5"), Medium Rocking Horse (22"), and Large Rocking Horse (27.5"). Alegacy Furniture 2008 - site development by "muellercomputers"